When I was getting ready to head to Mythos for dinner, I have to admit that I was a bit sceptical about its location. JLT, or Jumeirah Lake Towers, is well known to me for the offices and I just could not picture a really cosy Greek restaurant in this part of Dubai. 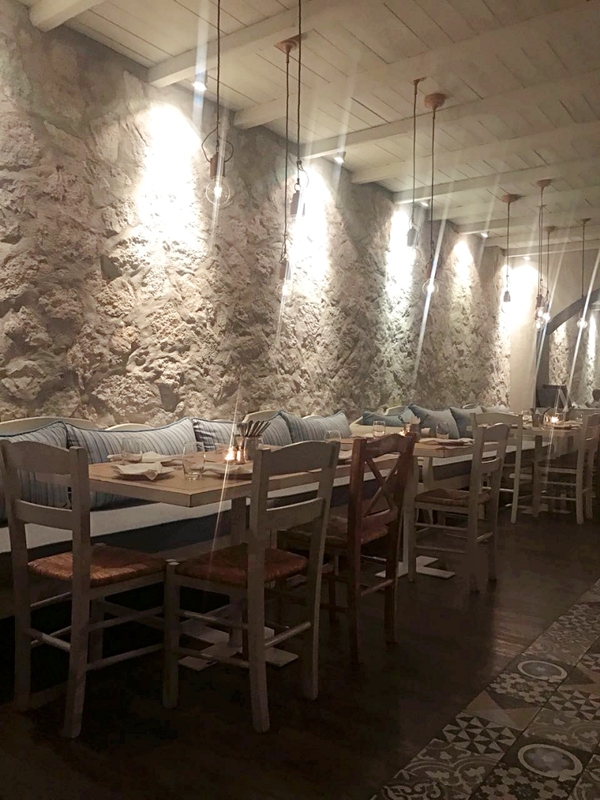 However, having been asked by several people if I had been to “that cute Greek restaurant in JLT”, my curiosity got the better of me and I knew I had to make a plan for a visit to see what exactly all the buzz was about. The restaurant was opened by siblings Alex and Fay Economides, who run M Management Company (founded by Alex in 2013) and also have NOLA Eatery & Social House under their umbrella. The concept for Mythos stemmed from the desire to have something more down to earth and wanting to take a breather from the slick and spendy restaurants that Dubai is well known for. And you know what? [SPOILER ALERT] I’d say they succeeded! My scepticism was dashed to pieces the second I stepped foot into this wonderfully authentic Greek taverna. I arrived at the front of the Armada BlueBay Hotel, walked in, and headed towards the painfully slow lift to take me down to the basement. When the doors slid open to the car park and I saw a sign for Mythos, I wasn’t particularly overwhelmed, to say the least. From there, I dutifully followed a trail of footprints through a small alley that felt like a concrete maze, swirling left, then right before coming to a stop in front of the unassuming door of Mythos. I’d been told that it was like an underground warren here and it really felt like that - as though I was somewhere I shouldn’t be. But then I opened up that door and my lackluster experience up until that point was all but forgotten. I was greeted with huge smiling faces within a beautifully designed Greek taverna and everything leading up to that moment - the average hotel entrance, the slow lift, the less-than-glamorous walk through the car park - were all wiped from my memory. I was in Greece! This feeling of excitement was only multiplied by the fact that we had just booked up Mykonos as part of our summer travel adventures (mixed with a certain someone’s 40th birthday bash!). Although you head to the basement level, that doesn’t mean you’ll be in a dark indoor area. Mythos has an outdoor space which is simply but beautifully decorated with a Greek olive tree that helps you imagine you might be in someone’s backyard in Mykonos. Indoors, it feels like being in a cosy coastal cave, with perfectly white stone-like walls and a whitewashed panelled ceiling. 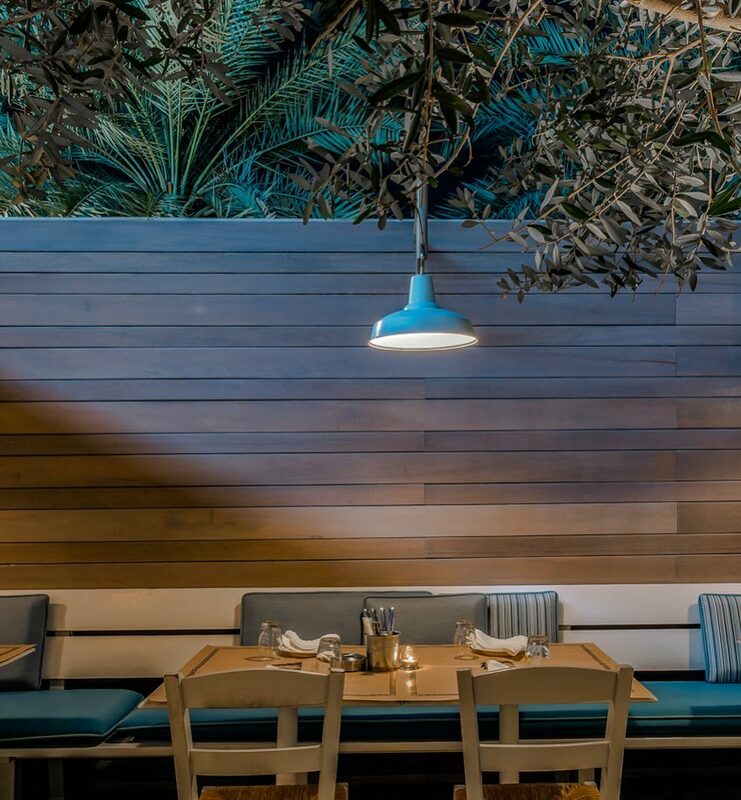 Beneath your feet, lovely porcelain mosaic tiles lay out a path within a polished wood floor and an oceanic colour palette of watery blues and turquoises fills the cosy restaurant, complemented by hanging light bulbs. There’s fabulously comfy seating with cushions that you sink into, creating a space where you’ll want to nestle in for the evening. Seriously, once you sit down and reflexively let out that “ahhh”, you probably won’t want to get up for the rest of the evening! In fact, it’s the perfect spot for a girls catch-up or an after-work supper. There was a great blend of co-workers and friends and although it was empty when it opened at 7 PM, the restaurant was packed by 8:45 PM. I couldn’t see a single empty table and the place was buzzing with laughter and happy chatter. What also stood out was the laidback vibe. I loved that there was no need to over-dress. It was absolute bliss being able to sit back and relax in jeans, flats, and a shawl, and simply enjoy the Greek taverna vibe without feeling the need to be “on” at all times. The staff were exceptional from the word “go”. Yes, there’s always going to be the slight bias when a restaurant is aware that I’m turning up but it wasn’t just my table that I paid attention to. I kept my ears and eyes open over the course of the evening and observed how all of the guests were being treated throughout the restaurant. You could say that the level of laughter was directly proportional to the happiness of the customer. All of the guests at Mythos were there for the same things that we were after: great food, great ambiance. In fact, Klaudia Ziemnicka, the general manager of Levee Cafe and Lounge at La Mer (and formerly of the Hamptons Cafe), had been there and said that it’s one of her faves. Keeping in mind that Klaudia is probably one of the best ladies in hospitality who I have (globally) met to date, her praise is a massive double tick! At Mythos, all pretentiousness is checked at the door. You won’t feel like another table being pumped out on the restaurant turnover conveyor belt and you could easily come back week after week for that Tuesday evening catch-up with your bestie. The menu here is absolutely delectable and overflowing with Greek goodies that will cater for everyone. On top of that, since it’s so reasonably priced, you can order a bunch of dishes to share with the table and nibble your way through a medley of flavours without fearing that you’ll break the bank. We started with tzatziki and melitzanosalata (grilled eggplant with tomato, onion, garlic, herbs, and red balsamic), both of which were so divine that I unabashedly asked for another two pitas so I could scoop up every last bit. Never mind that this was just the beginning of the meal! Then we dove into a plate of grilled halloumi cheese with homemade oxymeli (a traditional Greek dressing with vinegar and honey), which I highly recommend. A friend selected this dish but after cautiously trying a few bites, I ended up eating most of it. I now have a love for halloumi again! After polishing this off, we moved onto the shrimps saganaki, which was a bowl of shrimp in a tomato sauce with crushed feta and ouzo, and the roasted beetroot salad with spring onion and balsamic vinaigrette. I actually would have loved a bit more of a kick in both of these dishes but that’s really just personal preference. They were lovely as is and exactly what the menu described so I can’t complain! For the main course, we shared the chicken gyros merida, a huge platter accompanied by homemade pita bread, Greek fries, tomato, onion, and tzatziki. Honestly, we probably ordered one dish too many (our eyes were most definitely bigger than our stomachs!) but we ended up demolishing this platter, in between saying how full we were. And did this stop us from ordering dessert? No. I’m not really a dessert fiend but loved the saraglakia (even if the scale didn’t!). This is an oven-baked baklava filo dipped in vanilla syrup, covered with chocolate, and topped with roasted pistachios. Sweet, sticky, and a perfectly indulgent way to end the evening. Drinks-wise, the margaritas were fantastic and if you’re looking for something more unique to Mythos, they have plenty of signature cocktails, too! Quaff the Aphrodite’s Dream or Baklava Martini or, if you’re detoxing or simply not a drinker, quench your thirst with mocktails like Trojan Water and Iris Nectar. The names alone are enough to grab your attention and make you want to give them a sip and really, why not? There is also a selection of Greek wines but if you’re not sure about those, Mythos smartly includes several alternatives for those who prefer to play it safe with more familiar labels and varietals. The menu identifies which dishes are vegetarian and/or contain nuts, dairy products, alcohol, or pork. Definitely take part in the sharing concept here - between the well-priced menu and all of the delectable dishes, you’d be remiss if you didn’t! Mythos was a really beautiful surprise. Despite the slightly questionable location in the basement of the hotel which involves a traipse across the car park, it’s the perfect little laidback sanctuary where you can pitch up in your work gear or jeans and a t-shirt and feel wonderfully at ease. Another feature I love is its size. I’m a firm believer in the fact that Dubai is missing a trick on this. It’s time for the overabundance of sprawling restaurants and big chains to move over and make way for the creative small restaurants and boutique hotels! 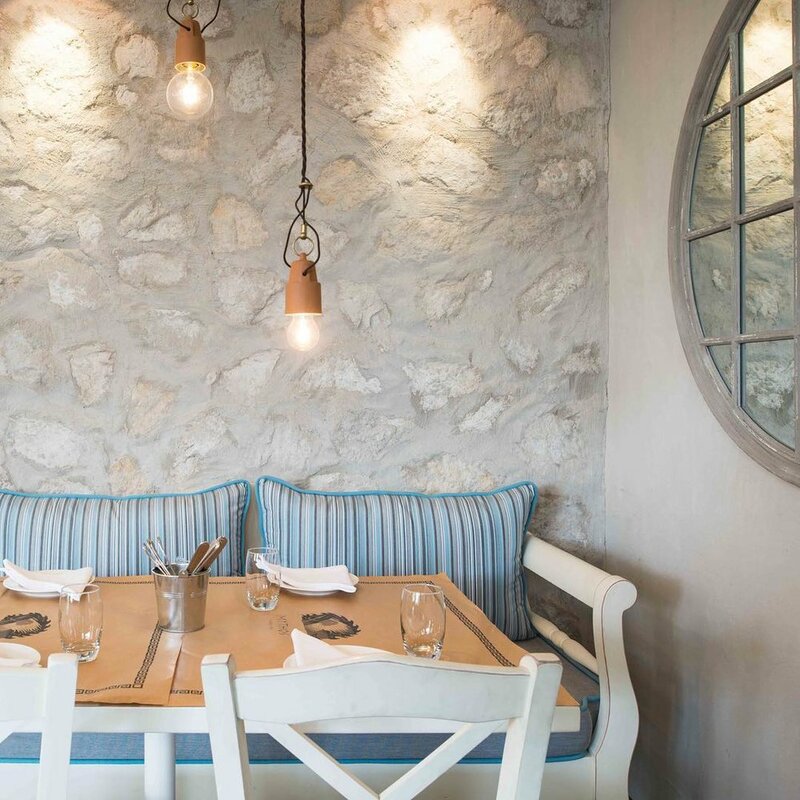 Don’t miss out on this friendly Greek taverna where everyone who walks through the doors becomes family and where there a majority of the clientele become regulars who know the staff by name. This taste of Greece has also whet our palates for our upcoming trip to Mykonos! We can’t wait to continue our Greek love affair this summer. Mythos, you have one hell of a big thumbs up from us because you genuinely deserve it!